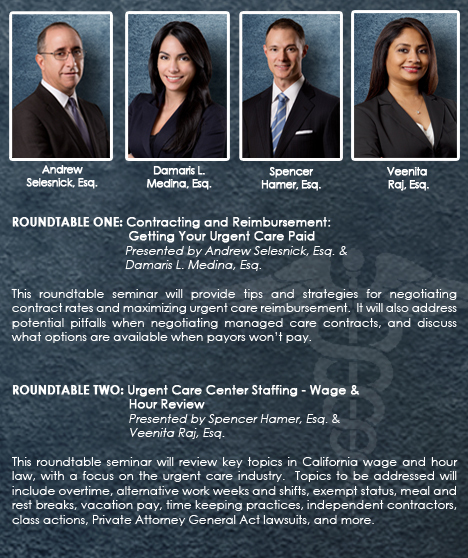 Michelman & Robinson, LLP held its COMPLIMENTARY “Hot Topics in Urgent Care” breakfast Seminar on May 22, 2014. Attorneys from our Health Care and Labor & Employment Departments held an informative and intimate roundtable discussion on the latest topics and trends in Urgent Care. Andrew Selesnick and Damaris L. Medina provided tips and strategies for negotiating contract rates and maximizing urgent care reimbursement during the first roundtable session titled “Contracting and Reimbursement: Getting Your Urgent Care Paid.” They also addressed potential pitfalls when negotiating managed care contracts, and discussed what options are available when payers won’t pay. Spencer Hamer reviewed key topics in California wage and hour law, with a focus on the urgent care industry during the second roundtable session titled “Urgent Care Center Staffing – Wage & Hour Review.” Topics addressed included overtime, alternative work weeks and shifts, exempt status, meal and rest breaks, vacation pay, time keeping practices, independent contractor, class actions, Private Attorney General Act lawsuits and more.